News - Kasabian for Glastonbury Festival 2017? Kasabian for Glastonbury Festival 2017? 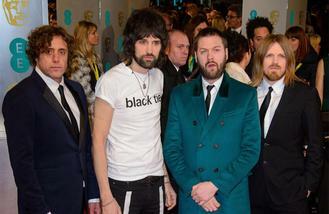 Kasabian are rumoured to be headlining Glastonbury Festival next year. The 'Fire' hitmakers are tinkering away at their sixth studio album, which is expected to be released early next year, and when a representative for the band was asked if they could be performing on the legendary music festival's Pyramid Stage next June, they didn't say no. The spokesperson told NME magazine: "The band are currently finishing their new album." Frontman Tom Meighan - who is joined by Sergio Pizzorno, Chris Edwards and Ian Matthews in the indie rock band - has said that they decided to go back to their roots and write a guitar album rather than sticking with electronic sound of their last offering, 2014's '48:13′, for the new album. He shared: "I said to Serge [Pizzono], 'Let's go back to our roots, let's go back to guitars.' He said, 'That's what I've done.' He played me the demos and I was like, 'F***ing hell! That's great that is.' It's nothing like '48.13', there's not f***ing interludes or any of that s**t."
Meanwhile, guitarist Serge has revealed that they were inspired by John Lennon's theory that rock 'n' roll is like a chair and you have to create your own version of that chair. He said: "I heard this John Lennon interview and he talked about the chair. He said what rock 'n' roll is, it's just a chair and The Beatles' version of rock 'n' roll was the chair. So I thought, 'Wow, I want to make my version of that chair.'" 'Creep' rockers Radiohead are the only band confirmed for the music festival, which is held on Worthy Farm in Somerset, South West England. And the festival's organiser Emily Eavis recently poured cold water on speculation that Daft Punk and The Stone Roses are to perform. She said: "As ever, 99 per cent of the rumours are untrue." System of a Down will release new music in 2017. Veteran rocker Sting has learned to live with hearing issues because he refuses to wear an aid. Laura Mvula often feels “excluded” from the world of mainstream music. Rihanna has achieved 110.5 million digital song certifications. Anastacia is to release her first ever live album 'A 4 App' just for her fans through her app. David Bowie was planning on forming a secret band, according to Tommy Hilfiger's new memoir. Little Mix have been added to the line up for this year's Capital Jingle Bell Ball. Snoop Dogg is planning to "smoke weed every day" now that California has legalised recreational marijuana. Coldplay have been announced as the headliners of the first Global Citizen Festival in India.